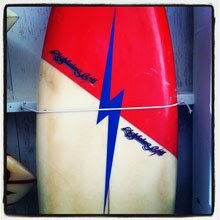 : Board Collector: East Coast 80's fan. 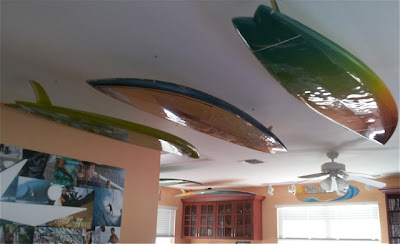 I live in Lantana, Florida and have enjoyed collecting and restoring Surfboards for years. Here's my current collection but its always expanding. After I got out of the Navy in 2006, I decided to move to South Florida and become an Ocean Lifeguard at Lake Worth Beach, Florida. About 2 years ago I found this old beat up vintage board, threw some wax on it and had a blast. 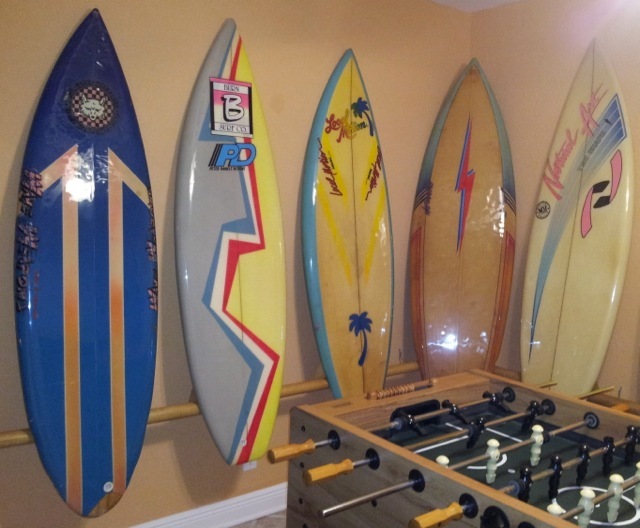 Ever since then I've been riding, collecting and restoring Vintage Boards. All the boards on my wall are from the 80s Era held up by a bamboo rack that I made and the ones on my ceiling are from the 70s era. 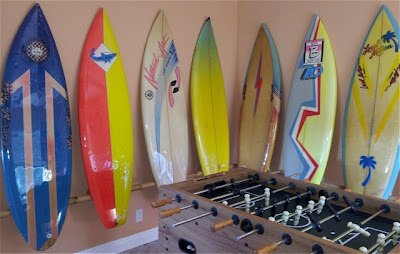 The giant knee board with the skull and cross bones is the original Lake Worth Lifeguard Paddle/Knee board from the 70s that my girlfriend found in the trash. I cleaned it up with sanding and polishing compounds. None of my boards have been re-tinted, there all original. 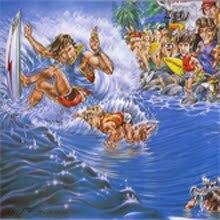 I don't think it holds much of a dollar value but to me that board is priceless because of all the lives saved and history behind It. 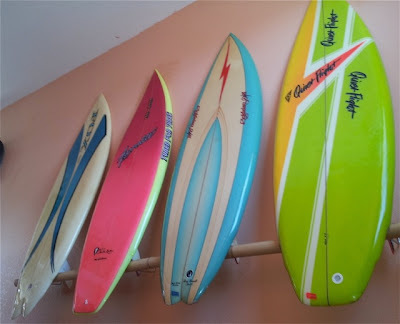 I found most of my boards online, by various adds I've posted around town and seeing people surf them and cutting them deals for them. 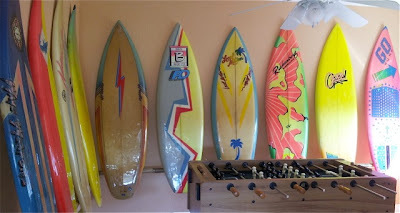 I recently met a Guy standing in line at Island Watersports Surfshop that overheard me talking about vintage boards and invited me to start working at his shop and he's been teaching me all about restoring surfboards. 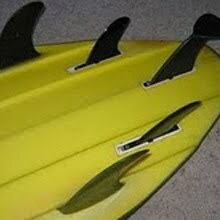 I'm not collecting boards to sell and make money, my boards aren't for sale. One day they will be passed down to my child. 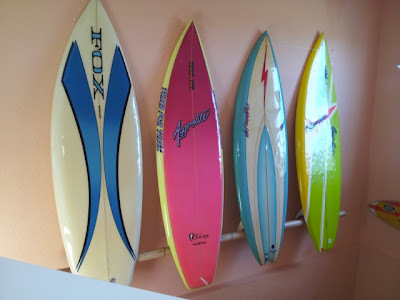 My favorite is that 1980 Blue Fox Wave Weapon because of its local nastolgia and that it represents a time when they were beginning to make high performance boards known as Wave Weapons by Greg Loehr working under John Parton who is the creator of Fox Surfboards. 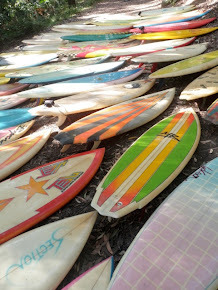 I collect these boards strictly because I love the sport and all the history surfing has. All of my boards have been wet sanded from 500 all the way up to 2000 grit sand paper then polished with multiple compounds to remove scratch lines and give them their brilliant shine. I have my sights set on 6 more boards that are around town. 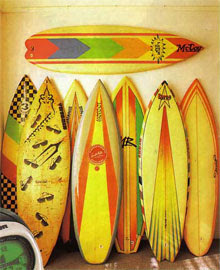 There is a:1980 Town n Country Twin Fin, 1970 Nomad Single Fin, 1970 Hawaii Surfboards Twin Fin, 1970 Wave Tools Single Fin and a 1980 Local Motion Twin Fin. 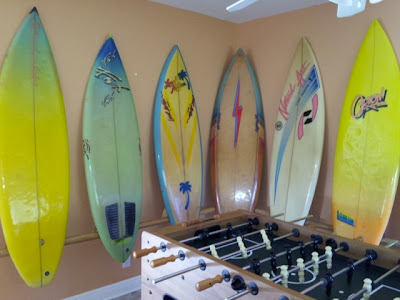 I'll prob never stop collecting but I can only fit around 15 more boards in my boardroom so I'm becoming very picky on what I get. How do you prevent the bords falling down when only held in by bottom bamboo rail? 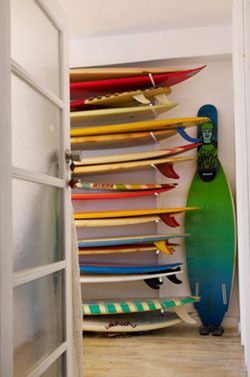 Looks good but dont they domino effect if someone bumps them? 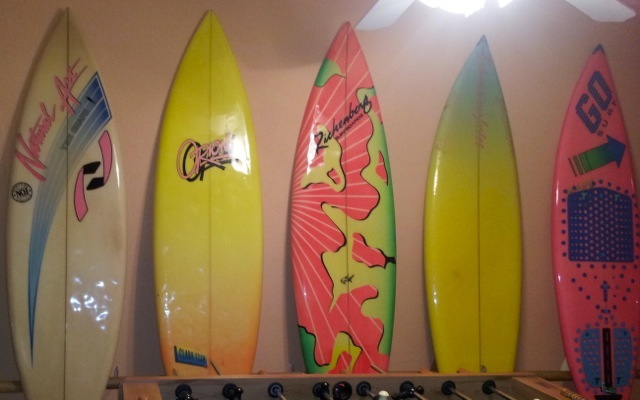 From SoCal, have lots of boards as well. Interested in a trade? 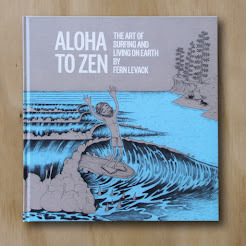 Lorenzo, Huntington Beach. 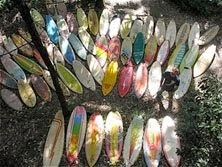 Well first off out of 30 only 5 of my boards were for sale & sold via ebay so the statement "all" is a bit extreme... The selling prices were $200 for the gordon & Smith, $150 for the Sebastian Inlet, $160 for the Fox, $280 for the Local Motion & I had offers for the bolt up to $675 but I traded the burnt Bolt for a board I liked better (M.T.B.) with no cash exchanged. Also not that I need to explain myself but the prices I sold those for we're what I paid for them. My collection is always revolving and from what I see improving. 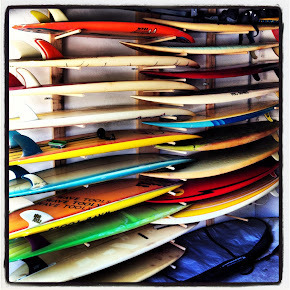 There's no point in keeping a board if you see another board that interests you more. 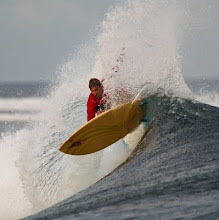 Its all about how much you enjoy the board then pass on for someone else to enjoy. So to whoever "Anonymous" is, thank you for your expert knowledge and professional opinion on curating vintage board prices & your deep concern regardling my collection, if your also a collector I hope yours is always improving to meet your standards as well. Have a good day. 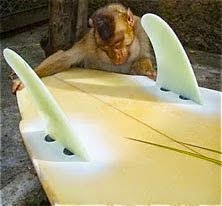 Surfs Up!! 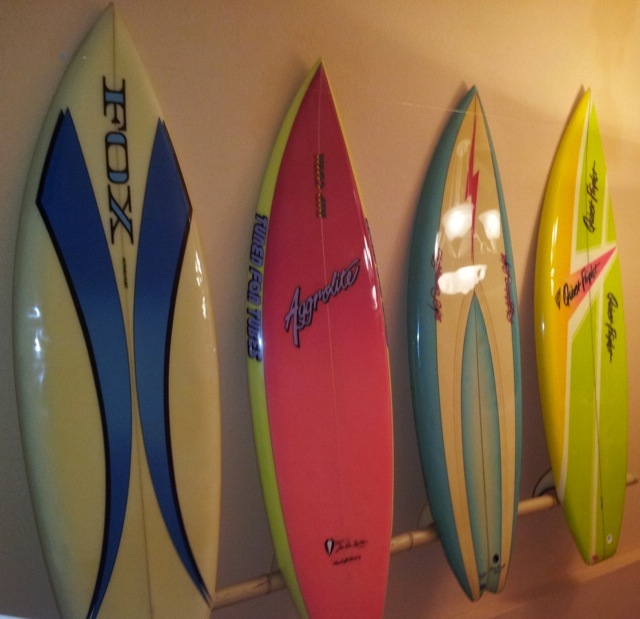 Dude just wait to ya see what new boards I was able to add! 70s Lopez Gun with Wood glassed in fin! There all near Mint!! Im stoked, I'll send ya pics l8r on when I get a chance! Have a good day Brotha! i see you have a bing! 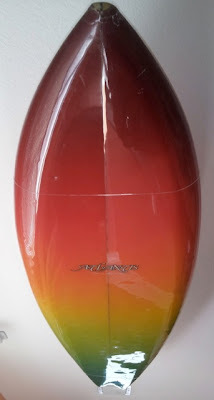 is it a bonzer? 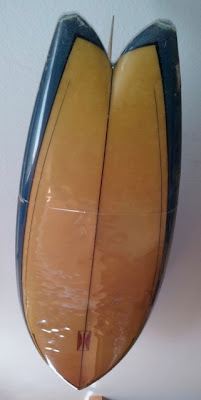 No its a 1970s Single Fin Bing around in great condition with a slight sun tint. 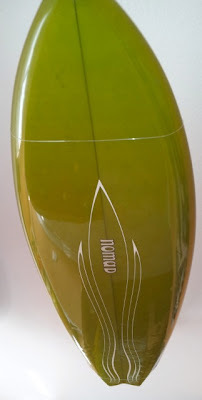 The board has been wet sanded & polished by me so a super glossy mirror like shine! 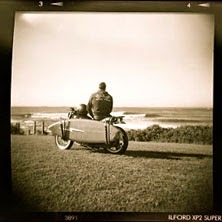 Nick, any tips on the polishing, I have a couple of oldies that i reckon would look smick with a good polish. Yes definitely email me at petrinonm@gmail.com all il call ya n tell how I clean em all up to shine! Hey I have a old Stewart Hydro Hall in pretty good shape. Is it worth anything? 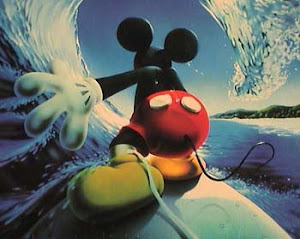 I dunno if my last went through but yah just shoot me a email at petrinonm@gmail.com and il let ya know whats up. The owner stewart might be interested in it as well and possibilly offer more money for sentimentle reasons. 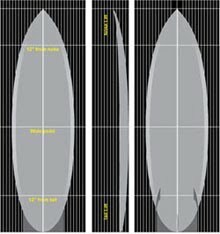 I have a Fox custom 7ft 3 find shaped by Ted James. Any one interested ?